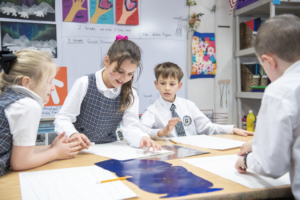 Providence Academy offers an exciting, hands-on, weekly art program for all grades. Students are encouraged to embrace their creative gifts without fear of failure as we strive to maintain the message that there are no mistakes in art, and everything can be made into something new. From the Principles of Design to popular art culture, with an emphasis on Art History and the role it plays in today’s society, children are guided through weekly projects that explore watercolor techniques, pastels, tempera, clay and various other mediums. The middle school will review Art History from 12th century to the late 19th century. We will move from there to learn about artists within periods and Schools of the following: Impressionism, Post Impressionism, Expressionism and Abstraction, Cubism, Modern American Painting, Regionalists, Social Realists, and Genre Painters. We will touch on some of the more modern styles of art as well. Students will apply works of art specified to create their own unique art piece by applying the elements of art and principles of design to their work. We will work with various media including pencil, colored pencils, markers, pastel, drawing, ceramics, and sculpture just to name a few. 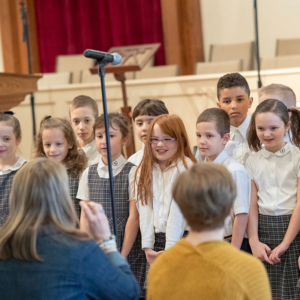 Providence Academy offers a variety of performing arts opportunities, including multiple concert performances and extracurricular theatrical productions. All Lower School students attend weekly classes in music where students learn music theory, history, and analysis. Students build performance technique through singing and playing instruments as they progress through each grade level. Lower school students participate in a variety of performances throughout the year. By the time students reach our upper school, students are encouraged to apply their musical knowledge in a performing ensemble course. Upper School music offerings include: Choir and Music Appreciation. We also offer opportunities to connect with local area ensembles and private music lessons instructors to augment learning in music class through our After-school Private Lessons Program. Just as Plato and the Greeks of antiquity saw the importance of Music and listed it in its own category under the Quadrivium, alongside Arithmetic, Geometry, and Astronomy, we believe music should share an important role in a child’s education at Providence Academy. Music is important in our culture, in the church, and in a believer’s life. It is an expressive language, which we can use to communicate with each other, and, most importantly, with God. Music influences us in many ways: physically, mentally, emotionally, and spiritually (1 Samuel 16:23). Music is where the liberal arts are combined: math in rhythm, languages in theory and choral works, art and theatre in “sound painting” and improvisation, and physical education in the fine motor skills and movement in performances. Music provides a language in which a harmony of intellect and creativity may blend. Most importantly, we believe our students should believe that music is a gift from God to be used for His glory (Colossians 1:16). Students will grow in their understanding of music as they listen to the classics from the Baroque period through the jazz age. Students will develop their ear to identify instruments, musical pieces, and musical periods. Students will also learn music terminology and music theory in order to express in writing accurate descriptions of music. They will study composers and their contributions to the history and development of music yesterday and today. In addition to the above, students will learn basic guitar, keyboard and vocal production skills, as well as how to be a full body listener in preparation of being lifelong listeners and learners of music and fine arts.